Below is a 5-question test on finding the area of an ellipse. This test is linked to the lesson on finding the area of an ellipse, which also has a test. An ellipse is a squashed circle. It is symmetrical about its longest axis (called the major axis) and its shortest axis (called the minor axis). 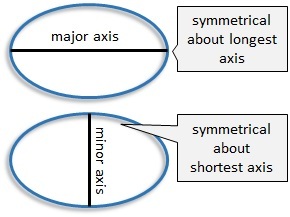 Half of the major axis is the semi-major axis. 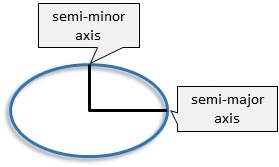 Half of the minor axis is the semi-minor axis.